“A Final Fantasy for Fans and First-Timers”. This is what Final Fantasy XV opens with every time I boot it up and it truly echoes throughout the experience. 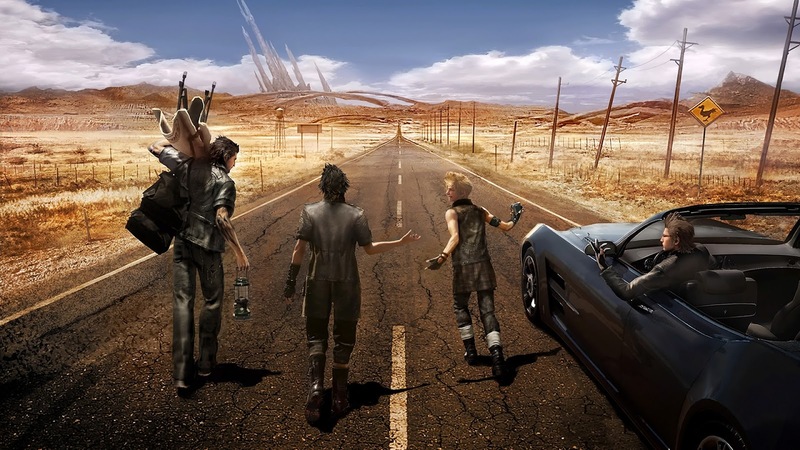 The wide open world and the easy to learn battle system are much like a western RPG, while the story, character relationships and skill trees are closer to what Final Fantasy players would be used to. I wouldn't say it's a perfect balance of the two, with XV switching back and forth between the two from time to time, but in the end it doesn't need to be. 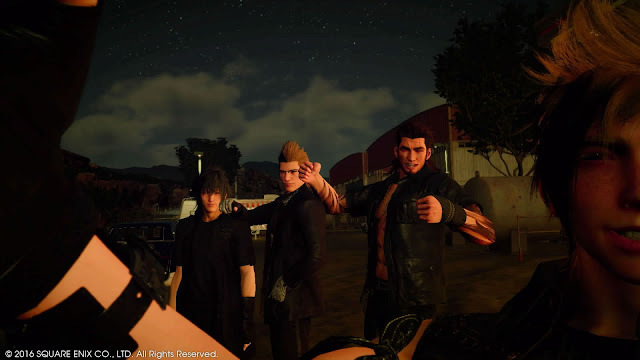 Final Fantasy XV excels as an open world RPG and the dynamic friendship between the four men on their royal journey satisfied the Final Fantasy fan in me and created an addictive environment for me to run around and quest in with new characters I love. It’s not the Final Fantasy fans are used to, but with an open mind you may find yourself completely addicted to the open world, questing playground of Final Fantasy XV just like I am. Final Fantasy XV is set in the world of Eos, a large world divided into three different areas, with two of the areas, Lucis and Niflheim, being in conflict. 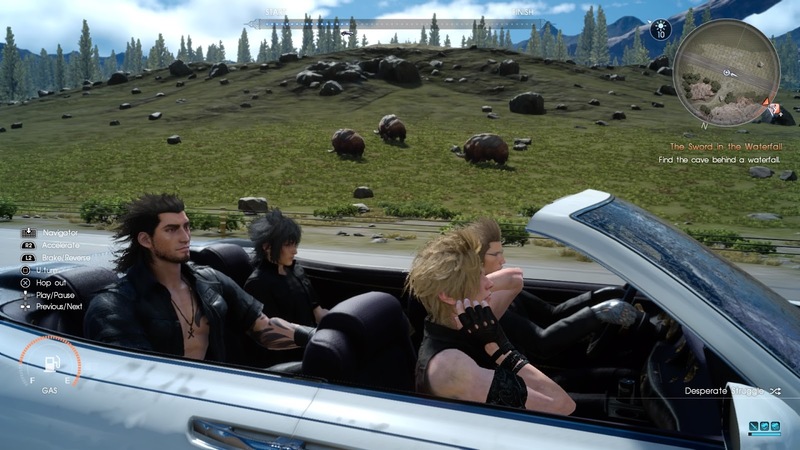 The story begins with Noctis and his friends Prompto, Ignis and Gladiolus on their way to Noctis’ wedding to the oracle from Niflheim Lunafreya, only for a lot of things to go horribly wrong along the way and Noctis’ road trip becoming a much more consequential one with his throne at stake and a lot of loss along the way. As with a lot of stories involving royalty in Final Fantasy, I found the story a little convoluted at times even with prior knowledge from Brotherhood: Final Fantasy XV and Kingsglaive Final Fantasy XV. The story can go from zero to eleven at times, with earlier chapters feeling quick and light in comparison to the more linear and emotive last through chapters which had me glued to my console wondering what would happen next. I didn’t mind though, as I found myself engaged much more by what was happening to Noctis and his friends and watching their dynamic grow and change became my focus in the story. What makes the group so engaging is the story moments being heightened by the open world aspect of Final Fantasy XV. While there is a large and epic story to be completed, Final Fantasy XV allows it to be done at your own pace, with plenty of side quests, photo spots and areas to explore until you feel like getting back to the core story. This open world is the heart of Final Fantasy XV, with story moments given weight along the way by the group that always have a lot to say, and the frequent conversation being a great way to get to know the characters. Whether it’s Ignis discovering a new recipe, Prompto falling in love with every girl he meets or Gladiolus’ deep care for the group, each character had something to add to Noctis’ hard journey. I felt satisfied by Final Fantasy XV’s story in the end and a lot of it is due to how much I loved the four together and their genuine friendship. While the complex story and character archetypes feel close to Final Fantasy XV’s roots as one of the most classic JRPG series of all time, battle is where it starts to move away from this. 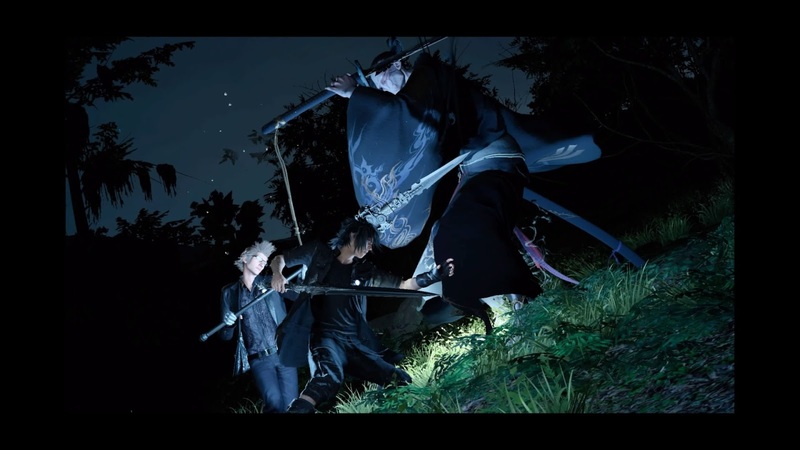 Combat is action-based, with no Active Time or Turn Based system like previous Final Fantasy games being featured in XV. Instead there are shortcuts and easy to hold down attack buttons making battle intuitive and simple. My usual strategy of exploiting elemental weaknesses changed to one of blocking in time and using the cool warp-attack on unsuspecting enemies. Final Fantasy XV’s combat can definitely have strategy applied to it, but there’s also the option of just choosing a weapon, holding down the attack button and as long as your party are at a good level and you dodge sometimes, you’ll probably win. Don’t get me wrong - XV’s combat is fun and rewarding and boss battles had their fair share of challenges thanks to status ailments and near one-hit kill attacks. But it’s a clear difference to Final Fantasy games of the past and may not satisfy fans of the more traditional Final Fantasy experience. For traditional Final Fantasy fans, skill trees, summons and special attacks are present in the battle system to tie in that JRPG layer, but it is certainly on a smaller scale than previous Final Fantasy games. Even though Final Fantasy XV is another step away from the more traditional Final Fantasy-style game, the incredible journey I had both in the story and outside it doing quests made me not really care. Running around the world of Eos and making my own experience made me not worry about its faithfulness to the genre and as I write this, I’m still pretty addicted to the freedom I feel driving around the big world in the Regalia with four great characters. There were a few things to stifle my enjoyment occasionally, the main thing being the long load screens I faced whenever I fast traveled or loaded my save. I bought my PS4 at launch, so it's definitely not a PS4 Pro and this is the first game I’ve felt like my game should have been really going faster than it was. A genuine issue with Final Fantasy XV is also that despite how open the world is, there are definitely some invisible walls I found myself faced a lot of occasions I decided to free run in the world like I’ve done in western RPGs such as Skyrim. Noctis can’t climb or jump down everything for some reason, so I sometimes felt frustration when I could visually see a faster path to where I wanted to go but it was impossible to access. But as I mentioned Final Fantasy XV’s cast have a lot of little conversations along the way and the pleasantness of these outweighed most frustrations I have and I learnt to either accept or play around most invisible walls that stood in my way in favour of continuing the fun journey. Final Fantasy XV may not be the most traditional JRPG in the world, but thanks to the vast world, I came to like the blend of old and new in Final Fantasy XV. For me, Final Fantasy XV is everything I like about western open world games blended with the JRPG elements that make me feel at home. By the end of Noctis’ journey, I felt like I had truly gone on a journey with the group in many ways - I watched Noctis and the group stumble and grow stronger along the way and I explored a great new world. Most importantly, I didn’t hesitate to come back again after the credits rolled, something I haven’t felt the need to do in a main entry of Final Fantasy since Final Fantasy X. Final Fantasy XV’s journey is worth experiencing if you’re a Final Fantasy fan with an open mind or a fan of Western RPGs looking for something different. In my opinion, it was well worth the long wait for the great newest entry to the Final Fantasy series. I'm so addicted to this open world that I literally have to force myself not to play sometimes. Not as 'JRPG' as other Final Fantasy games, but still incredibly fun. What did you think of Final Fantasy XV? Who's your favourite of the main characters?